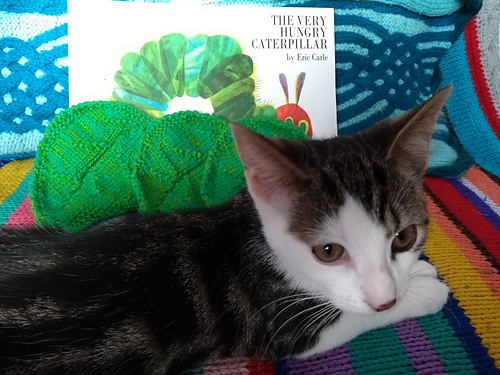 Home › Cats › Muffins, watermelon, leaves and eggs? Hi all! Been enjoying my bank holiday weekend by doing more birthday stuff! Meeting up with some friends and gaming with other friends as well, even managed to sneak in a trip to my LYS and found a ball of wool that was whispering…just one! And once I get through my queue of knits I know exactly what it’s going to be! Muffins! Ok, they’re really actually a modified version of the free pattern: Divine Cupcakes by Maiya Becker – I worked K2P2 rib on the cake bottom to make the cupcake wrapper (increasing an extra two sts in the base to do so) then doubled the number of knit rows called for in the frosting to make it taller. Oddly enough, I really wanted to make these so was glad to finally get them on the needles! 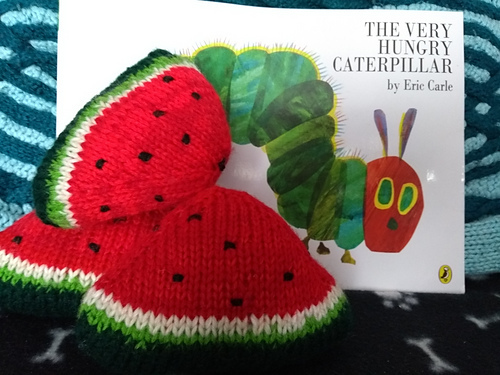 I worked the free pattern: knitted watermelon by Elaine Simper double stranded to give a more textured/mottled appearance particularly in the watermelon flesh. And on Sunday he ate through a nice big leaf. Again, double stranded for more colour variation and I used the free cloth pattern: Leaf Cloth Trio by Theresa L. Jones, I used Leaf 3 as I like that it both curved and had veins. 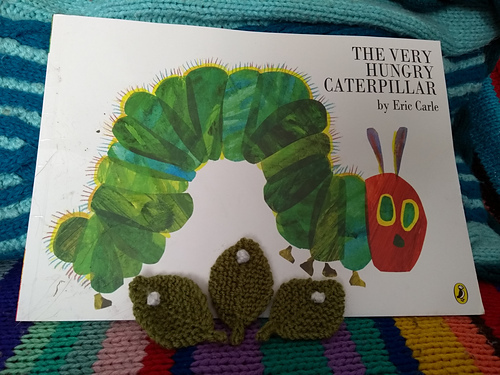 When I was working on the leaves, Felix asked me yet again to knit the caterpillar egg from the beginning of the book, to which it responded that no, it would be so small it would be lost instantly. She then countered my argument by stating the egg could be sewn onto its own little leaf, then it won’t get lost. I worry that she’s out smarting me and she’s not even four. Not that it’s difficult to do that, but still. A little egg on a little leaf. The leaf is made using yet another free pattern: Woodland Wreath, Leaves by Frankie Brown. 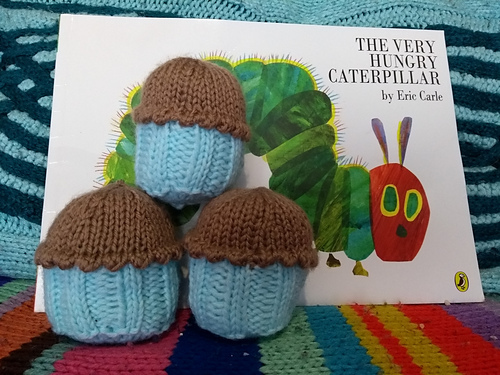 The egg is simply a little bobble I knitted up and sewn on afterwards. 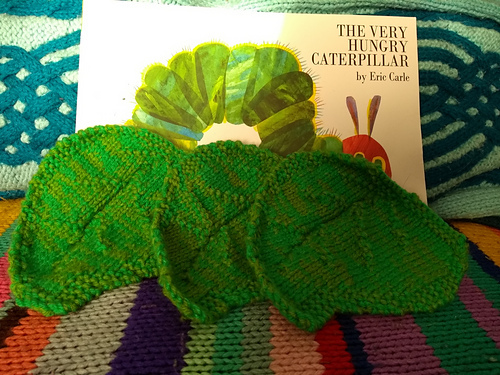 Alright, that’s enough typing for now, I have butterflies, cocoons and fish to get knitting. ‹ Lollipops, pie and sausages – oh my! haha, that’s a great photo of Ziggy!